Cashel Fly Leg Guards - Deter annoying flies! Protect your horse's legs from flying insects with these cool leg guards made of a durable mesh. 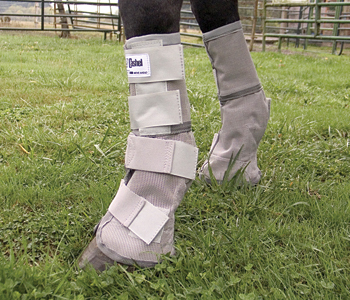 If your horse is stomping to keep the bugs off the shoes can ultimately work loose. These are a great idea. Contoured fit helps to reduce sagging. The have a padded back rim and pasture pad for added comfort. Hook and loop closures for an adjustable fit. Give your horse a break nasty pesty insects; these are really a safe alternative to toxic fly sprays.